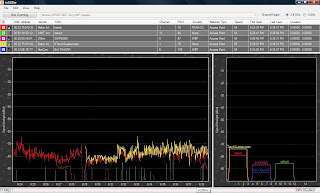 There are a number of programs to check and track WiFi signals, but often they're complex or not that informative. InSSIDer was a simple program, with an easy to use interface, has that changed with version 2.0? Well, first it helps if you're familiar with the previous version. 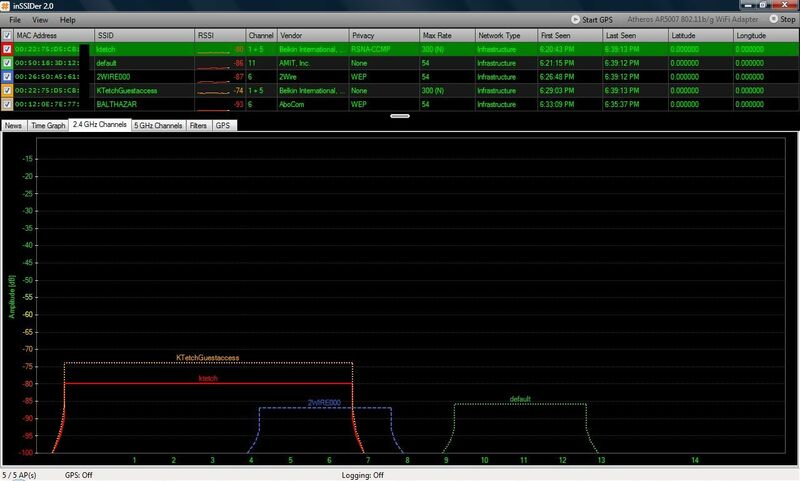 The idea of InSSIDer, is to provide an& analyses of WiFi signals, showing signal strength, SSID (as the name implies) and encryption method. A rolling timeline is provided, and there's even the ability to connect to a GPS unit, to try and track down the hotspot location. 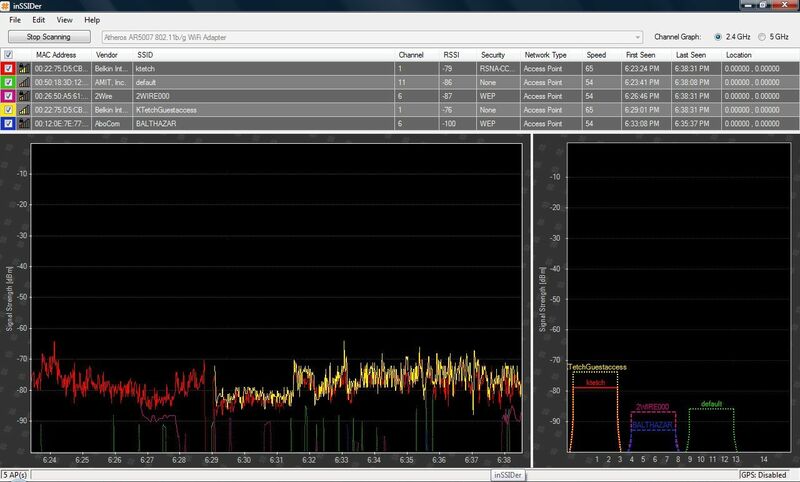 It worked with both 2.4Ghz and 5Ghz systems, meaning you could identify 802.11a/b/g signals (and see -n, but not recognise them). For Version 2.0, there are a few changes. It can now identify 802.11n networks, and has a fancy new interface. It can also filter, and save GPS locations as keyhole files, ready to be loaded into programs such as Google Earth. Al very nice, but the interface is a bit of a problem now. In the previous version, the channel graph, and the signal graph were displayed at the same time. In the new version, they're tabbed, so you can either look at the channels covered, OR the signal strength. Here's the latest version, run at the same time as the old version above. As you can see, there are some changes in information between the two. The channel ranges for my Belkin Router read differently, although it does correctly describe it as being an -N. The spread of the information to two tabs, rather than combined does make it harder to run 'hands off', however, just letting it run and observing, instead you're forced to flick between the two. Perhaps an option to have both on screen at once would have been nice. Meanwhile, the added information, clarity of display, and the ability to identify 802.11n networks helps no end. Reviews were conducted on a Compaq CD50-210Us laptop using the built-in Wifi, and running Windows Vista. The fixed known access point was a Belkin F5D8235-4 wireless router with a secured (ktetch) and unsecured-guest access (KTetchGuestAccess) connection running. Tests were run on a public road at approximately 18:30 on Monday October 18th 2010. Thanks for writing this review of inSSIDer 2.0. 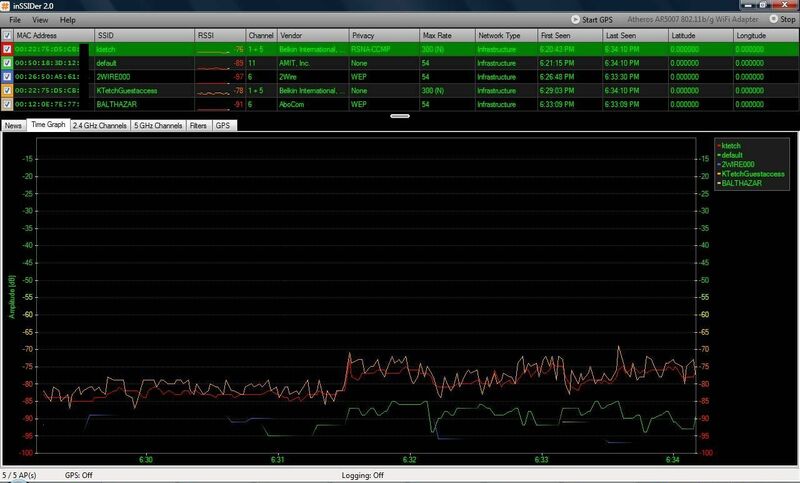 I'm one of the developers at MetaGeek that works on inSSIDer. When we designed it, we switched to tabs because we had more information we wanted to display... but having the graphs side-by-side is our most common feature request now, so we're looking into a good way to add that feature to 2.0.